Your wedding dress is a very special part of every couple's memories. Every detail expresses the significance of your wedding day. Hi Tech Organic Cleaners understands the importance of your wedding dress. We offer both cleaning and preservation services in order to keep your dress as beautiful as the day you walked down the aisle. Cleaning your wedding gown soon after your ceremony is a very wise decision to maintain its appearance. 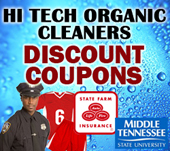 Hi Tech Organic Cleaners have been working with wedding gowns for many years and understands the best care practices. Come visit us with your gown today to speak to a dress care professional. Remember, prevention is the best cure to keep your dress beautiful. Hi Tech Organic Cleaners also offer wedding gown preservation for new or old dresses. Our main goals in preservation is to keep the dress from turning yellow, repair or prevent light damage, and clean any oxidation or mildew spots. Keeping your dress clean is the first step to preserving its beauty for future generations!